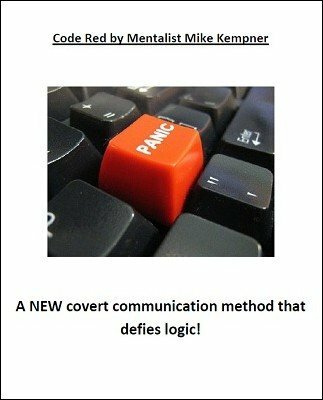 Code Red , from a non-mentalism perspective, has several meanings, including being a code used in hospitals to alert staff to various emergencies. The use of codes is intended to convey essential information with zero misunderstanding so that errors can be avoided. Within hospitals, codes can be posted on placards throughout the hospital, or even on employee ID badges for ease of reference. Code Red in hospitals is certainly an established protocol. Within mentalism, however, I first introduced Code Red in my performance in 2014, so it is a new concept. As the technique’s originator, I define it within the world of mentalism as a covert communication method that defies logic. EFFECT: For the first demonstration, you log into your email account and send an email to the main (genuine) spectator. She confirms that your email was received in her own email account, and she reads silently what you wrote in the email only to herself (this is the CODE RED). After this, you have a 2nd (genuine) spectator secretly tell you a word. There is no force, it is a completely free selection. It truly can be ANY word. For the second demonstration, you do not email or text message this secret word or any other word to the main spectator (this can be verified by even technology engineers who specialize in email communication---you truly do not send anything in any way). Furthermore, you do not talk or signal in any way this secret word but you still have to do something on your mobile device. The room is completely silent. Yet, the main spectator by using his own mobile device will know the secret word and reveal it to the audience.